As long as people have had hair, they have needed away to tame tangles and most importantly, help arrange and style their hair. Hair brushes have been around for thousands of years, but changed dramatically in the mid 20th century with the introduction of space age plastic, flexible rubber, synthetic fibers and ionic ceramic composites. What started out as a very basic grooming implement, the hair brush has morphed into a highly specialized grooming and styling tool to complement the new hand held styling Blow Dryers. 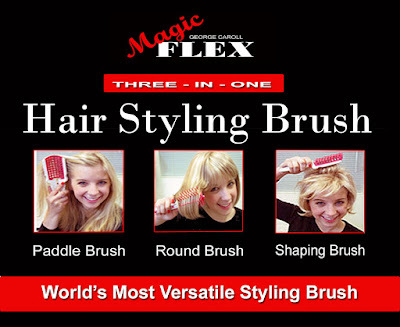 An example this new styling brush technology at its best is the Magic Flex the World's Most Versatile Styling Brush. This high-tech styling wonder incorporates three of the most popular styling brushes in one: Paddle Brush, Round Brush and Shaping Brush. The Magic Flex styling brush is made of a durable heat resistant soft flexible composite that's easy on the hair and scalp. The secret lies in its "flexible living hinge" which allows the "flex grip" handle to fold "open and closed" and spring back to its original Paddle Brush shape like magic. It includes a air flow diffuser net to hold and dry hair in place. What's more, its the only hair brush that includes a built-in-styling comb and includes a unique "retainer clip" designed to hold it "open" for use as a semi-round brush and "closed" when not in use, making ideal for travel. Just look at all you can do with the Magic Flex Brush: defuse to dry hair in place, lift and shape for volume, de-tangle wet and dry hair, roll hair over or under, straighten unruly waves, scrunch to encourage curl, crimp and wave, tease, comb and make blow dry styling quick and easy. One styling brush does it all making the Magic Flex the world's most versatile hair brush and one of Hollywood's best kept styling secrets. Modern cosmetic technology is turning our every day personal care products into spa-like-treatments and the new salon shampoos and conditioners are perfect examples of this new technology at its best. To receive the maximum benefits from this new technology many now also include new professional procedures (listed here) to give your hair a spa-like treatment at home between salon visits. 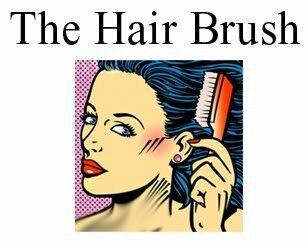 Brushing only takes a few seconds and is the “first step” for professional home hair care. Brushing before shampooing lifts dandruff and excess oil from the scalp, removes tangles, stimulates circulation and helps prevent styling aid build-up. To prepare your hair and scalp for shampooing its best to use a simulated or natural bore bristle brush. 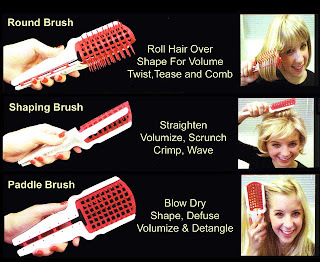 Brush from back to front, side to side and up under hair if long. For an even coverage and though cleansing of the hair and scalp, wet hair and apply shampoo starting at the back of the head were hair is thickest. And up under the hair if long, followed by the sides and front using pressure point message. If shampooed frequently one application may be sufficient. However, to remove excess styling aids use a second application applied in the same manner and rinse with cool water. Empirical research has shown that the use of “pressure point” scalp message when shampooing and conditioning your hair is a most effective way to stimulate circulation, relax tense scalp muscles and encourage healthy hair growth. To use pressure point scalp message, bend head forward and slide finger through the hair starting at the temples where blood enters the scalp, followed by the front and back of the head. To message PRESS, ROTATE and SLIDE fingers back and forth to move and loosen the scalp. This professional procedure takes less then a minute and is the most effective way to assure an even coverage of shampoo and conditioners and promote healthy hair growth. To give your hair and scalp a deep conditioning spa-like-treatment, when time allows, wrap a hot wet steam towel over the conditioner. This 60 second steam treatment is a most effective way to deep cleanse scalp pores, remove dandruff and styling aids, stimulate circulation, relax tense never endings and deep condition the hair and scalp. To thoroughly rinse off shampoo and conditioners reduce the water temperature and finish with a color water rinse. Rinsing with cool water firms and polishes the hair fiber, locks-in-moisture and helps hair dry faster. Hair and scalp will stay cleaner and styles last longer with a cool water finishing rinse.